In January 1987, in my senior year of high school, I asked my friend Clay if he was interested in going with me to see a nearly three hour Japanese version of Shakespeare's King Lear. 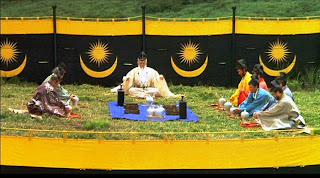 He said sure and we went and were overwhelmed as we experienced Akira Kurosawa's Ran in a commercial theater. It premiered in the United States 25 years ago today, but it took that long for a print to make its way to Oklahoma City — one week before the film made its debut on video as a matter of fact. Thankfully, I did get to see Kurosawa's last masterpiece projected in its proper scope, the way God intended, instead of on a cropped VHS version. 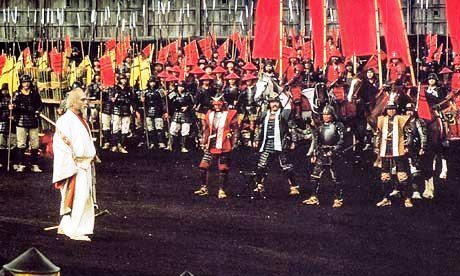 As 2010 draws to a close, it seems appropriate that one of this blog's final anniversary tributes is to Kurosawa's last great film and it takes place in the year that marks the centennial of the master director's birth. I wasn't originally scheduled to write this tribute, but the original writer broke a promise at the last minute. I don't mind that I'm doing it, even though it means it's a rush job while I'm still recovering from an illness, because it means that I've seen Ran twice this year and it's really reinforced how great it is and how secure its place is near the top ranks of the Kurosawa canon. The film earned him his only Oscar nomination as best director and, of course, it's an outrage that he never earned more but at least he got one and it was for a great film. 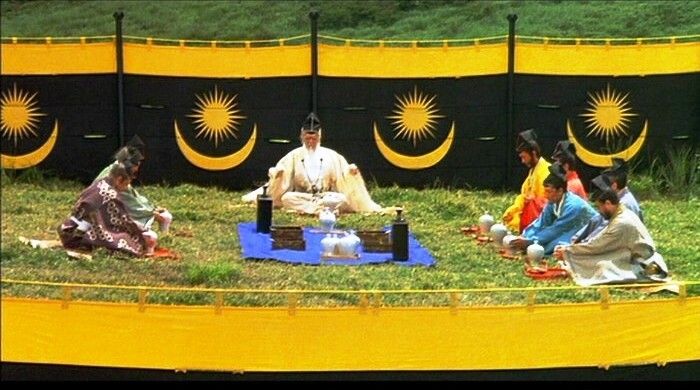 It's also amazing while admiring the great color cinematography by the team of Asakazu Nakai, Takao Saitô and Shôji Ueda and to realize that though Kurosawa made his first feature film as a director in 1943, Ran was only the fourth movie he made in color. It also was the most expensive film made in Japan up to that time, though with a total of $11 million it seems like chump change compared to costs today. 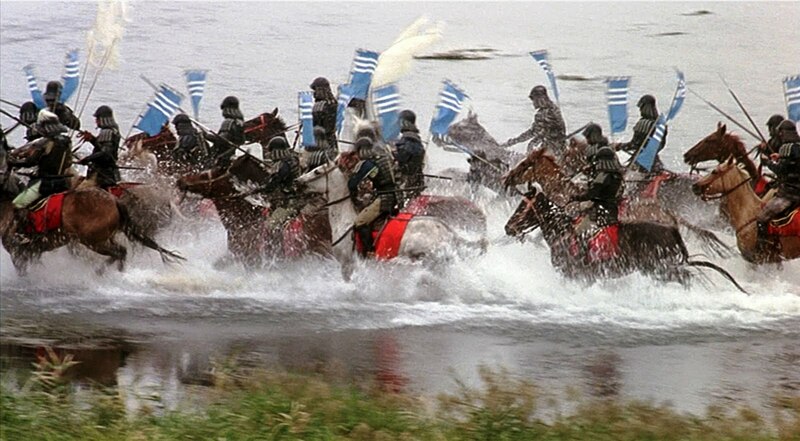 Of course, as you witness the amazing battle sequences, remember that not only was Kurosawa mostly blind when he directed these stunning scenes, he also staged them free of CGI, so there was more skill and ingenuity required than today's computer trickery that makes almost anything possible. Ran takes Shakespeare's famous play and makes several key changes: It transfers the action to feudal Japan and its Lear equivalent, Lord Hidetora Ichimonji (Tatsuya Nakadai), divides his estate among his three sons, Taro, Jiro and Saburo (Akira Terao, Jinpachi Nezu and Daisuke Ryû), instead of three daughters. The biggest change though is the addition of the character of Taro's wife, Lady Kaede (Mieko Harada), who plays somewhat like Lady MacBeth without the sympathetic side, but really is a creation that belongs more to film noir than Shakespeare. She's one of the most dangerous femme fatales in cinematic history. She'd make the legends such as Barbara Stanwyck's Phyllis Dietrichson quake in her wake: Kaede is that cunning, ruthless and frightening. Following an outing hunting for a wild boar, Hidetora gathers his sons as well as friendly feudal chieftains Lord Ayabe and Lord Fujimaki (Jun Tazaki, Hitoshi Ueki) to announce that he's giving his eldest son Taro dominion over his lands. He'll retain his title and a small contingent of men, but move into a small tower while the younger sons will be given a second and third castle. He hopes this ends a lifetime of warfare and brings on a period of peace. Well, hope springs eternal and it doesn't even last during the gathering. 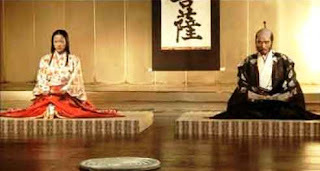 Hidetora misinterprets the outspoken Saburo, who is eyed as a potential spouse for daughters of both Ayabe and Fujimaki, and banishes him from his kingdom. "When flesh is rotten, even if it is your own, you must cut it away," Hidetora says. 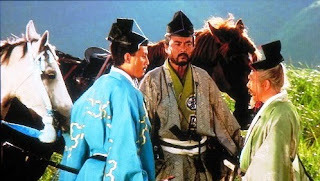 His loyal aide Tango (Masayuki Yui) tries to intervene, saying he just took Saburo the wrong way and Tango ends up getting kicked out of the realm as well. 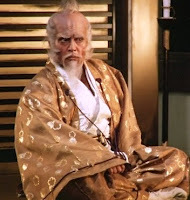 Of course, anyone familiar with Lear knows that Saburo serves as the Cordelia equivalent while Taro and Jiro will turn out to be less than loyal offspring to Hidetora. I saw a production of King Lear once and during an intermission, I heard another audience member say one of the funniest lines I've ever heard about the play. "You know, he wouldn't have all these problems if he just had a good estate planner." Now, I don't know if that's necessarily true and I'm sure there weren't a lot pf estate planners working in feudal Japan, but I thought it was funny nonetheless. Now, Hidetora learns rather quickly what a mistake he's made when he returns and sets up shop in the tower of the first castle that he has ceded to Taro. His loyal fool Kyoami (Pîtâ) joins Hidetora's men in making fun of Taro's inability to make a decision and turns it into a song. One of Taro's guards happens to be there and makes moves toward Kyoami to kill her when an arrow suddenly strikes him down. It turns out to be one fired from a bow held by Hidetora who was watching from a window above. Later, Hidetora receives a message inviting him to a dinner at the castle with Taro and Kaeda, ostensibly to celebrate the transfer of power. However, when Hidetora arrives he's shocked to find that Taro expects him to sit at a lower level than he and his wife, even though part of the deal was that Hidetora would retain his title. 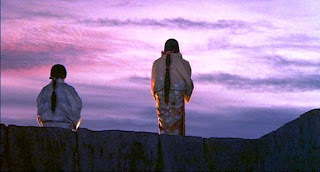 Taro tells him that he's letting him get away with killing his guard, but he's deeply offended by the song mocking him, which can still be heard being sung by Hidetora's men, and wants his father to sign a decree making the change in leadership official, marking it in his own blood. A shocked and outraged Hidetora complies, but vows he won't stay there and makes plans to stay with Jiro in the second castle immediately. Unfortunately, before Hidetora can make his way to Jiro, Taro already sends him word that their father is unstable and that he should not allow him to stay. When the old man arrives and is spurned by his son, he is shocked and turns his back on him and ventures into the wilderness with his men. They try to seek food from peasants, but Taro has warned peasants that if they helped Hidetora, they would be killed, so they all fled to the mountains. Hidetora's dreams for a time of peace certainly were not coming to fruition. Meanwhile, the similarly wandering Saburo and Tango run into Lord Fujimaki. Fujimaki tells Saburo that obviously Lord Ayabe isn't interested in taking Saburo as a son-in-law, but Fujimaki is outraged by what Taro and Jiro are doing and he's still open to it and offers to give both Saburo and Tango protection. Tango thanks him for the offer, but he feels he must remain loyal to Hidetora and decides to disguise himself and follow him to try to protect the old man. Hidetora, hearing that another party has taken control of the third castle, decides that they should take it back, so he leads his men to it, unaware that what awaits him is a trap that's been set by Taro and Jiro. The battle that takes place at the third castle really serves as the the film's premier setpiece and one of the greatest sequences Kurosawa ever put on film. It's very violent and bloody and there's a very good reason it earned an R rating. 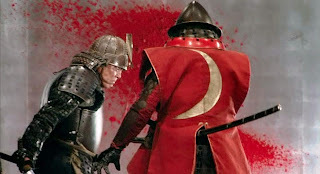 Once Hidetora and his men realize it's a trap, after they've firmly ensconced themselves in the castle, the melee is long and brutal and instead of the usual sounds of warfare, the scenes of fighting are covered exclusively by its musical score. Bodies pile up, concubines commit mass suicide, all set to music. This continues until a rifle shot stops the music and the sounds of battle return. 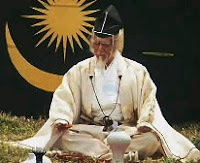 Hidetora sits cross-legged in what appears to be a catatonic state as arrows whiz past him, sounding like the hissing of an army of snakes, interrupted by the occasional volleys of gunfire. Hidetora loses his entire army in the conflict, but the other side suffers losses as well, including Taro, making Jiro the new leader of the Ichimonji clan. 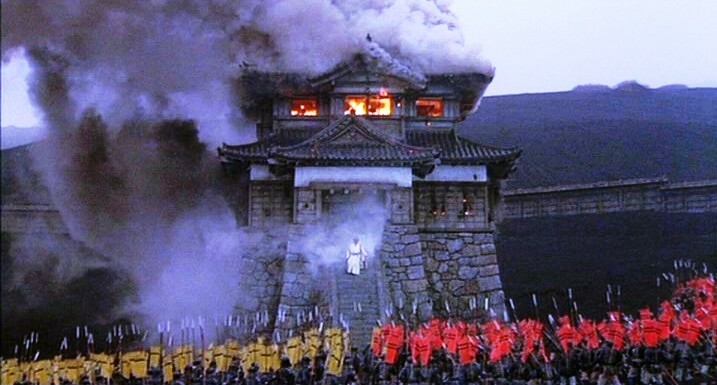 Hidetora, still in a state of shock, marches out of the burning castle through the lines of gathered troops on both sides and just exits the castle grounds with none of the soldiers making any effort to stop him. Jiro returns to tell Kaeda what you would think would be sad news about the death of her husband, but this is when we really begin to learn what a piece of work she is. 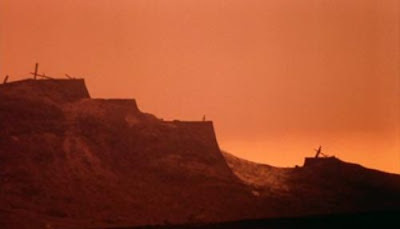 Earlier in the film, we find that the real reason for her hatred of Hidetora is that back in his warrior days when he was accumulating his kingdom, he slaughtered her father and brothers and the first castle, where she has returned thanks to her marriage to Taro, was her home and where she witnessed her mother commit suicide. A little while after the news has sunk in, she returns to see Jiro and pulls a knife on him, telling him she's worked too hard to get back into the castle that was rightfully hers and she wasn't going to leave now. She belittles her late husband for not just killing his father, but then she turns her assassination attempt into a seduction. A sexually satisified Jiro promises Kaede that she needn't worry: He won't make her leave and implies that she can be his concubine, but this only sets her off again. She blackmails Jiro, telling him that if he doesn't get rid of his wife, she will tell everyone that he murdered his brother and raped her. Jiro relents. Kaede will be no one's concubine. 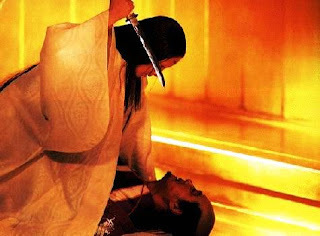 She then orders Jiro's main warrior Naganuma (Toshiya Ito) to kill Jiro's wife Lady Sue (Yoshiko Miyazaki) and bring her head as proof that it's been done. Naganuma, one of the few brave enough to stand up to this true dragon lady, tells Jiro he'll take orders from him but not her. He then brings her a head, but it's just one off a statue as he has sent Lady Sue off into hiding. Kaede is livid. Harada's performance as Kaede is magnificent. It's funny that it should occur the same year as Anjelica Huston's Oscar-winning turn as Maerose Prizzi in Prizzi's Honor, because Kaede's just as manipulative, only deadlier and without Maerose's subtlety. As Hidetora and Kyoami wander the wilderness, they stumble upon Lady Sue. Hidetora is shocked to find that she doesn't hate him since, like Kaede, he slaughtered her family. Her sad face make Hidetora feels bad and, as the old man says, it's even worse when she smiles. 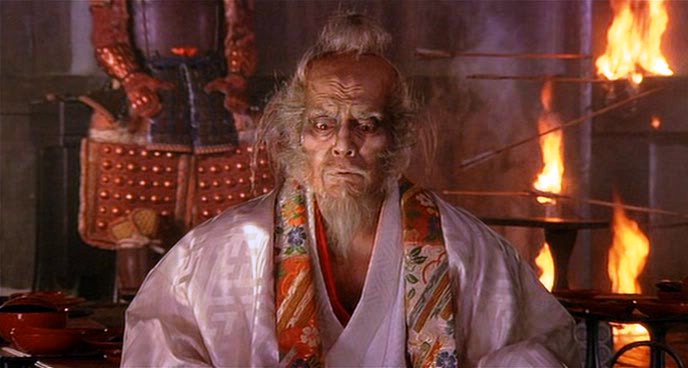 It raises the question though why in the world would a fierce warrior such as Hidetora marry off two of his sons to the surviving daughters of families he massacred. Let's face it, while Ran may be an adaptation of King Lear, it might as well be film noir because most of the male characters are dumb as bricks. Later, when a disguised Tango stumbles upon Kyoami, who has momentarily lost track of Hidetora, they find the lost old man and seek refuge in an isolated cabin. In the cabin, they find Lord Tsurumaru, a surviving brother of Lady Sue who is now blind because Hidetora gouged his eyes out during the battles. Tsurumaru finds solace only in his flute, which was a gift from Sue. Tango decides to lead Hidetora and Kyoami back to Saburo and safety with Lord Fujimaki while Tsurumaru decides he wants to reunite with his sister, who is staying where she can see the ruins of her former family castle. 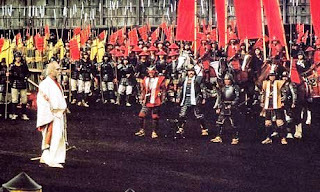 This all is setting up for the final battle with Jiro amassing his troops to take out his remaining brother and father, but fully aware the Lord Fujimaki and Lord Ayabe are nearby watching the action. 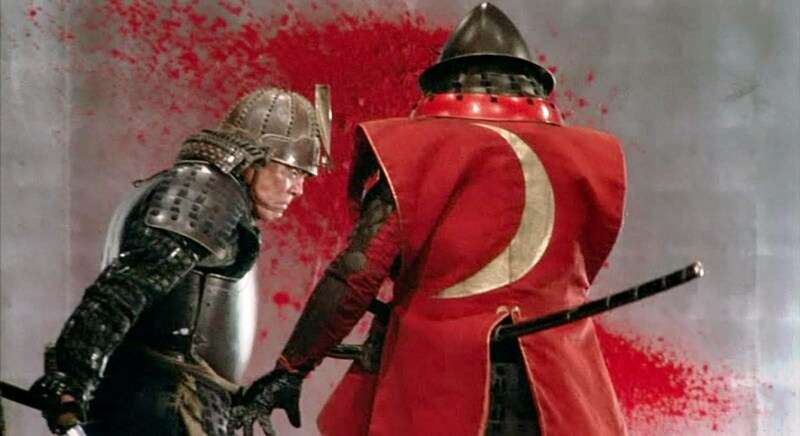 I won't go into details of how it all plays out, in case you haven't seen the film, but it turns out to be another great Kurosawa battle sequence. Amidst this chaos (and chaos is one of the English translations for ran), Lady Sue disregards her brother's advice and leaves to make an appeal to her husband Jiro, hoping she can stop this madness. Unfortunately, she runs into someone loyal to Kaede first. During the battle, a head is delivered to Naganuma and he unwraps it to find that Kaede got what she wanted from Lady Sue. A livid Naganuma doesn't even stop. Even though his master Jiro is nearby, he finally gives Kaede the comeuppance she has long deserved. 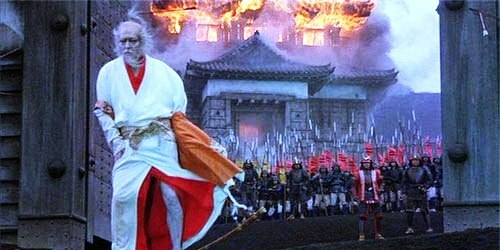 Now, since this film is based on one of Shakespeare's great tragedies, one shouldn't expect a happy ending from Kurosawa's version either, though he does deliver a somewhat sweet, pastoral shot to wrap up all the death and destruction. With as much difficulty as Akira Kurosawa had financing films in his final years, it's a miracle that he was able to make one last, truly brilliant one such as Ran. I'm just grateful that when I saw it the first time, I got to see it on the big screen. This has to be once of the most magnificent films in cinema. That castle battle sequence is a stunner -- entirely brutal, balletic, and yet beautiful. I remember seeing this on the big screen and was simply awed. Great examination of this one, Ed. Thanks for this.